Rain seemed to be a constant companion, confining friends for days at a time in Switzerland. Lord Byron challenged them to write a ghost story. Mary Shelley, wife of Romantic poet Percy Bysshe Shelley, accepted the challenge. She was the only one in the group who actually finished her tale, a macabre story about a gruesome fiend. When Shelley breathed life into Frankenstein’s monster, it’s doubtful that she could foresee that her creation would spawn so many spin-offs of the wretched form she first conceived when she was 18. In her novel, first published in 1818, there is no hunchback assistant, no criminal brain, no electrical equipment, and no angry villagers with torches who chase the monster. Those were added by director James Whale in the 1931 classic movie Frankenstein, and those were the parts that were spoofed in director Mel Brooks’ comedy, Young Frankenstein, in 1974. Where did Shelley’s repugnant creature spring from? She listened as her friends talked about the most recent bizarre medical experiments and their speculation on whether a corpse could be reanimated. 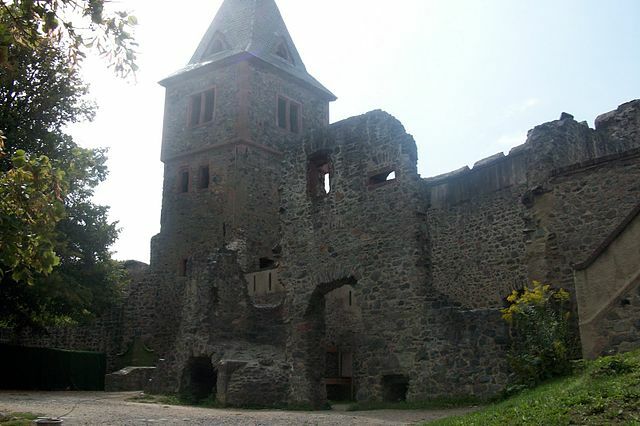 Frankenstein’s Castle, built in the 10th century, in Germany. “My imagination, unbidden, possessed and guided me,” the author said. When she awoke, Shelley opened her eyes in terror. Her “daemon” – monster – was hideous to look at, became uglier because of society’s rejection of him, traveled with great speed, and he never shut up. The monster would go on and on about what he had endured and explained his evil acts as retribution for being an outcast. With actor Boris Karloff’s monster, there is silence in Whale’s first movie. In Young Frankenstein, actor Peter Boyle’s monster learns the gift of gab and much more with hilarious results. 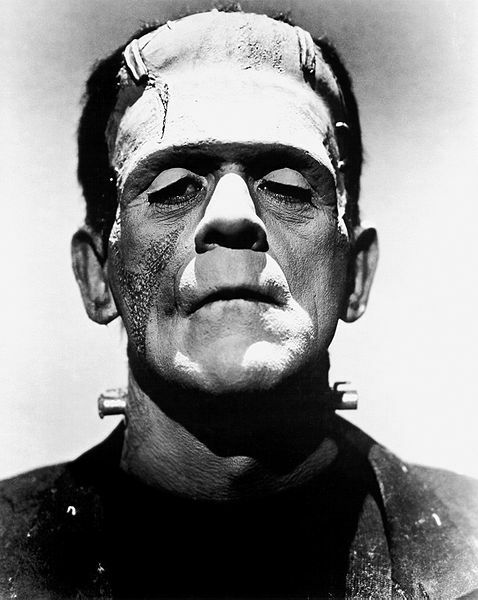 Dr. Frankenstein worked in isolation when he created the “daemon” in Shelley’s novel. By the time the monster hit the silver screen, however, the doctor had an assistant. But in Whale’s film, and in Brooks’, the assistants – both hunchbacks – bring back an “abnormal brain.” The difference? In Brooks’ film, Igor, played by Marty Feldman, is unaware that he has a hump on his back. Or, that the hump switches from side to side. Brooks’ monster also gets to show his gentler side. Gene Wilder (as Dr. Frankenstein) tries to reassure the villagers that his creation is a “cultured, sophisticated man about town.” Out comes the monster and Wilder, in tux and tails, as they do a song and dance routine to “Sitting on the Ritz.” All goes well until a fuse blows and scares the monster. Then, an angry mob puts him in chains. Boyle escapes. Dr. Frankenstein (Wilder) feels responsibility for his creation and wants to save him. He decides to have a transference operation. Before it is complete, the mob breaks in. The monster, now able to speak eloquently, tells them why he has behaved badly. The mob is properly chastised and apologizes. There are unintended consequences for your character when you hit Hollywood. In a way, all three versions – Shelley’s novel, Whale’s film, and Brooks’ spoof – send us the same message: science has a social responsibility. It’s just that Hollywood’s versions played out better for Dr. Frankenstein, Elizabeth – and in Brooks’ movie – his creation. Let’s just hope that society gets the intended message of the cosmic theme of man’s limits and the dangerous risks that arise when man tries to emulate God. Thanks for the history. I remember one literary analyst presented that F was really a portrayal or reflection of man’s dark side. That analyst’s take seems spot on. Thanks, Carl. This is a shortened version of a paper I did when I took a British Literature class in 2007 from Professor Lynn Dubois at Brevard Community College. It definitely was a creative, energetic class. Thanks Mom, great story. Mary Shelley’s Frankenstein is one of my favorite books. Mary Shelley’s story has been popular for 2 centuries. That’s some staying power and she certainly had quite an imagination. Thanks, Jenn. Great background info. Wow, only 18 yrs old – amazing, eh? Sure do miss Gene Wilder since his retirement. He was lost after Gilda’s death. He had the most mischievous, intriguing smiles, ever. I’m not sure when I first realized that “Frankenstein” was written by a female, let alone a teenager. Incredible story. Chek out “Young Frankenstein,” again, Michael. It never gets old. Mel Brooks, his merry men and women were a hoot. I love the story of Frankenstien. Then inner good vs. evil which we all wrestle with. A great story just in time for Halloween. My timing was perfect then. Thanks, Barb. Good vs. evil stories are always intriguing. I’m glad you enjoyed it. I just watched that link, Kate. Thanks for that. Great bit. I can tell that everyone in “Young Frankenstein” had a great time. Sad to say, Subhan, I feel that message is like shouting into the wind. So many will not hear it and will tamper away … perhaps, putting themselves and others at risk. Thank you for your comments and blessings. That is true. Humans do have unlimited power to transform themselves, but this unlimited power of humans is unfortunately abound to their limitations as part of nature. And for that reason, bowing to the Supreme Being is the only appropriate response. Very true. Thank you for your comments. Blessings to you. I was thinking, just two days ago, about cryogenics — the process of freezing the bodies of people who have died, in the hope of reviving them when a cure for their illness has been found. The real difficulty, of course, is not the curing part, but the reviving. I doubt we’ll ever figure that one out. It is an entertaining concept, though. Charles, it is intriguing to speculate what the source was for the monster she created. I was also surprised the first time I read Frankenstein by how different it was from the movie adaptation. The Frankenstein from the book was much more intelligent and that made him all the scarier. The movies really dumbed Frankenstein down. I agree that having an intelligent “daemon” is far more terrifying. Thank you for your comments and for visiting my blog. Excellent observation, Lisa. I believe Shelley was trying to wow the group – and live up to her mother’s very famous name (also a writer). She certainly succeeded. What an interesting post, Judy – I learned a lot from it and the comments/replies! “Young Frankenstein” is one of my favorite movies. Just the other day, AA Hubby and I were driving down the road laughing about “the monster” dancing on stage and singing “Putting on the Ritz.” So funny because it was so absurd. Another funny (ridiculous) take on the story is “Abbott and Costello Meet Frankenstein.” Seriously, though, per Charles’ comment and your reply, it is fascinating (creepy, too) to think of dead people being revived. Like all strange things (cloning, for example) I can imagine it might very well happen. ICK. Which circles back to Dolly and the baaaaad news that she was euthanized after developing lung disease. note from earthrider to AmiableAmiable: It’s all well and good to want to relive the glory days of a great pet, but it would be far better if they adopted a pet needing a home. Think of how much love all would benefit by. It’s been a few years since I read Frankenstein, but the impression I came away with was one of intolerance on the doctor’s part. At first, the monster seeks only acceptance. It seems Dr. Frankenstein turned him into a monster several months after he brought him to life, which for me, added to the pathos in the story. I’m not sure if Mary Shelley intended that or not. Peter, I enjoyed your post on science fiction stories. You wrote about a couple I want to check out. This story may be one of the first science fiction stories. I like your interpretation of the novel. It did include a lot of suffering. I initially felt sorry for the monster, and for Dr. Frankenstein, who immediately regretted creating the monster and abandoned the monster.The monster learned to read and talk on his own. He tried to connect with others, but they all feared him. Then the monster carried out his acts of vengeance against Dr. Frankenstein. Imagine conceiving this classic of literary fantasy at 18! To me the pathos is as compelling as the horror. Frankenstein’s horror about what he created … understandable. But, you’re right Madhu, the suffering the monster went thru is compelling. I wonder what Mary Shelley drew on for her inspiration.